What is Masklophobia? Good question. "My son has a fear of people in dress-ups". My son has a fear of dressed up people. 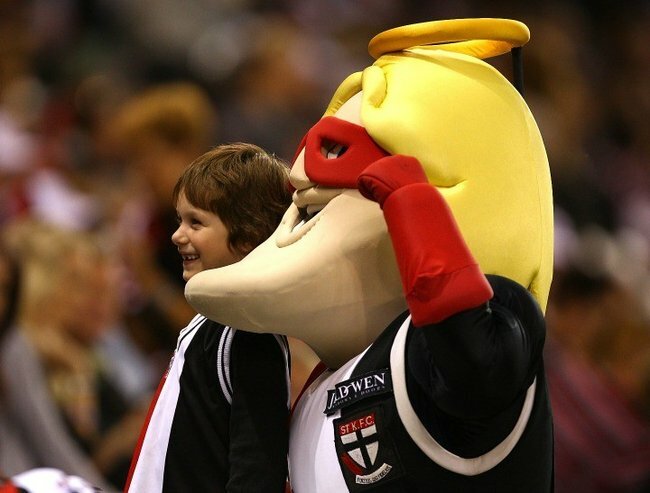 The first memorable incident happened at a children’s festival where a man was dressed up as a St Kilda football club mascot. He had an oversized foam head and a pointy chin. My two-year-old son sat on my lap, crying, shaking, distressed, craning his head back, trying to keep an eye on the perpetrator, repeatedly saying ‘where’s the man?’ I put it down to my son being overtired and having had too much sugar. Said ‘perpetrator’- The St Kilda Football Club mascot. But these sorts of incidents kept happening. 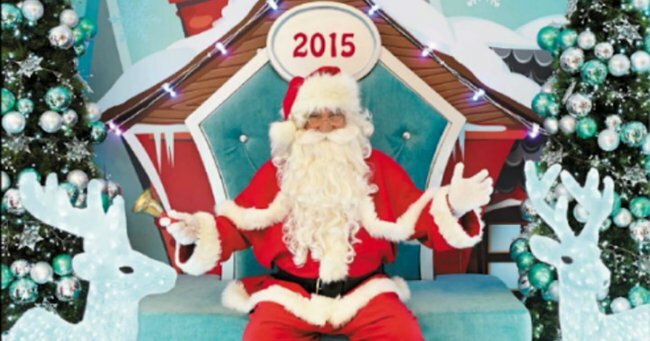 At my daughter’s kindergarten break-up party, Santa Claus arrived wearing a white beard and ringing a bell. My son was so distraught we had to leave the room. Last year, three months before his 3-year-old kindergarten break-up party, he started fretting, ‘will Santa be there, will Santa be there?’ I told him yes, probably, Santa will be there, but we don’t have to meet him. He asked about it so much that I decided to speak to his teacher, to see if we could somehow manage the situation. I didn’t want my son not participating in the end of year performance because he was fretting about the arrival of Santa. The teacher told me that after Silent Night was sung, we’d hear some bells, and Santa would appear. We had it all planned out, after Silent Night I’d swing in, collect my son, and escape outdoors before the big guy arrived. However, it went a little wrong, no one told me which direction Santa would be coming from, and as we tried to dart through the toilets, there was Santa, big, red and round, and very dressed up. It was like finding myself in a horror movie with my son, the very person we were trying to escape from was the person we’d bumped into. Needless to say, we turned around and ran through the audience, as well-meaning parents were shouting ‘wait, wait, Santa is coming!’ We continued to flee. This year we found ourselves at Tokyo Disneyland, a mecca of dressed up people. My husband and I kept a lookout and shouted code reds at each other, ‘Donald Duck approaching to the left,’ ‘Dopey behind the carousel.’ We managed to avoid my son having to handshake any of the characters. But it wasn’t until my son was playing happily in Minnie Mouse’s house in Toontown when I saw an expression come over his face, of ‘oh my goodness, Minnie Mouse might appear’. It was the first time I realised that this was a real fear and not something completely silly. His behaviour changed and he was determined to get the hell out of there. 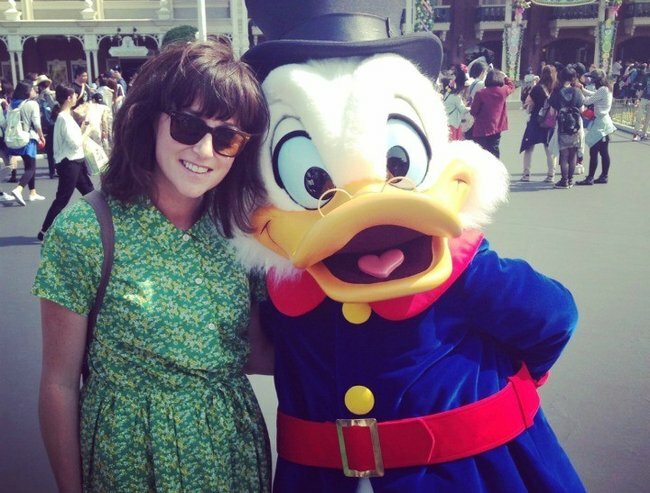 Rowena with Scrooge McDuck at Tokyo Disney. Mostly we can avoid dressed up characters. My son is able to cope with seeing them on stage at a theatre show. If we’re going anywhere where there’s the possibility of dressed up people, we reassure him that he doesn’t have to have any contact with them. We’re still a long way from my son hugging a dressed up person. But I keep on reassuring myself that I had an irrational fear when I was a child of walking over cracks in piers. I thought I’d fall through the cracks into the water. I still recall ruining a fishing trip with my grandfather and sister when he couldn’t get me to walk on the pier. They’d had to abort the fishing excursion and take little distraught me home to where the carpet had no cracks. Can I walk on piers now? Sure. So my son will hopefully either get over it, or find ways to manage it. And luckily, in day-to-day life we can mostly avoid a dressed up person. Rowena Wiseman writes contemporary fiction and children’s stories. Her latest novel is The Replacement Wife, about a woman who falls in love with another man, so she tries to find a wife for her husband. You can also find her on Twitter.